Whatever your fears are, it's hard to face up to them. But don't be afraid — we've got three insprational examples of people confronting their fears headfirst and getting over them, whether that's pushing themselves to the max, falling in love, or just losing their voice. Keep scrolling for this week's fear-conquering Video Worth Sharing. Amazon have launched this celebrity-studded ad just in time for the Super Bowl. Try not to think about the amount of money they've spent: the concept itself is a cute one and an effective way to personalise its personal assistant in the face of competition from Apple and Google. Practicing any sport to the Olympic level is a scary prospect. Both mind and body are pushed to their limits. 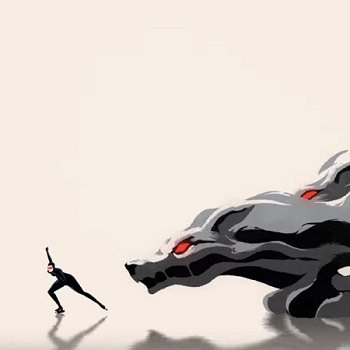 This dark, moody, unsettling animation brings to life the tension and excitement of the games for BBC Sports — and its unique creative will run for the length of the event. In this ad holiday is everything it's supposed to be: fun, carefree, dappled with sunlight and shade. Thomas Cook have achieved a gorgeously evocative picture of romance that makes you want to leave for a Greek island on the spot. It's aspirational advertising at its best. Want a weekly dose of video inspiration? Subscribe to our email updates for video tips, tools, and more Video Worth Sharing every Friday!